Are you looking to create new, memorable experiences for fans? Are you looking to implement a new promotion that has yet to be executed in the United States? Betfair, an official sponsor of Manchester United, recently announced a tremendous promotional offer that encourages the club's fans across the world to show their support. 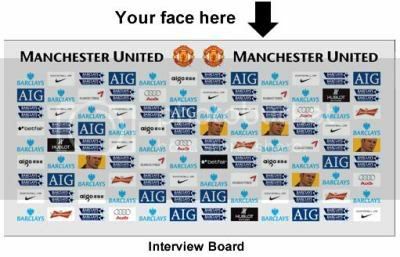 Betfair is offering a "Get Behind United" promotion that will give Manchester United supporters the opportunity to show their avid support to millions across the world by having their photos featured on interview board backdrops and perimeter field board signage at Old Trafford. Betfair, the world's first betting exchange, simply requires fans to submit a photo of themselves expressing their support along with their name and contact details on the Get Behind United promotional webpage. Betfair is running the promotion for a select number of upcoming Manchester United home games at Old Trafford (Everton - 11/21/09, Aston Villa 12/12/09). What's in it for Betfair? The promotion serves as a great way for them to drive awareness, reward existing fan customers, and leverage its partnership with Manchester United. All persons who submit their photos as part of the promotion are subject to have their photo used on Betfairfootball.com and agree to let Betfair (or its agents) use their data to administer the promotion and send them marketing communications materials.